1. Nat Commun. 2016 Feb 12;7:10697. doi: 10.1038/ncomms10697. Blüthgen N(1), Simons NK(2), Jung K(3), Prati D(4), Renner SC(5,)(6), Boch S(4), Fischer M(4,)(7), Hölzel N(8), Klaus VH(8), Kleinebecker T(8), Tschapka M(3), Weisser WW(2), Gossner MM(2). Author information: (1)Department of Biology, Technische Universität Darmstadt, Schnittspahnstrasse 3, D-64287 Darmstadt, Germany. (2)Terrestrial Ecology Research Group, Department for Ecology and Ecosystem Management, Center for Life and Food Sciences Weihenstephan, Technische Universität München, Hans-Carl-von-Carlowitz-Platz 2, D-85354 Freising, Germany. (3)Evolutionary Ecology and Conservation Genomics, University of Ulm, Albert-Einstein-Allee 11, D-89069 Ulm, Germany. (4)Institute of Plant Sciences, University of Bern, Altenbergrain 21, CH 3013 Bern, Switzerland. (5)Institute of Zoology, University of Natural Resources and Life Sciences, Gregor-Mendel-Strasse 33, 1180 Vienna, Austria. (6)Smithsonian Conservation Biology Institute at the National Zoological Park, Front Royal 22630, Virginia, USA. (7)Senckenberg Gesellschaft für Naturforschung, Biodiversity and Climate Research Centre (BiK-F), D-60325 Frankfurt, Germany. (8)Institute of Landscape Ecology, University of Münster, Heisenbergstrasse 2, D-48149 Münster, Germany. 2. Trop Life Sci Res. 2015 Dec;26(2):85-103. Bird Diversity and Structure in Different Land-use Types in Lowland South-Central Mindanao, Philippines. Tanalgo KC(1), Pineda JA(2), Agravante ME(2), Amerol ZM(2). Author information: (1)Department of Biological Sciences, College of Arts and Sciences. (2)Department of Secondary Education, College of Education, University of Southern Mindanao, Kabacan, North Cotabato, 9407, Philippines. 3. Ecol Evol. 2016 Jan 11;6(3):716-26. doi: 10.1002/ece3.1894. eCollection 2016. Local parasite lineage sharing in temperate grassland birds provides clues about potential origins of Galapagos avian Plasmodium. Levin II(1), Colborn RE(2), Kim D(3), Perlut NG(4), Renfrew RB(5), Parker PG(1). Author information: (1)Department of BiologyUniversity of Missouri - St. LouisOne University Blvd.St. LouisMissouri63121; Whitney R. Harris World Ecology CenterUniversity of Missouri - St. LouisOne University Blvd.St. LouisMissouri63121; Saint Louis ZooWildCare InstituteOne Government Dr.St. LouisMissouri63110. (2)Department of Biology University of Missouri - St. Louis One University Blvd. St. Louis Missouri 63121. (3)Platte River Whooping Crane Maintenance Trust 6611 W. Whooping Crane Dr. Wood River Nebraska 68883. (4)Department of Environmental Studies University of New England 11 Hills Beach Road Biddeford Maine 04005. (5)Vermont Center for Ecostudies PO Box 420 Norwich Vermont 05055. 4. Zookeys. 2016 Jan 13;(552):137-54. doi: 10.3897/zookeys.552.6934. eCollection 2016. 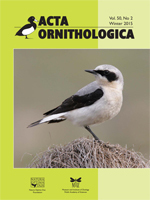 Dataset of Passerine bird communities in a Mediterranean high mountain (Sierra Nevada, Spain). Pérez-Luque AJ(1), Barea-Azcón JM(2), Álvarez-Ruiz L(3), Bonet-García FJ(1), Zamora R(1). Author information: (1)Laboratorio de Ecología (iEcolab), Instituto Interuniversitario de Investigación del Sistema Tierra en Andalucía (CEAMA), Universidad de Granada, Avenida del Mediterráneo s/n, 18006, Granada, Spain; Grupo de Ecología Terrestre, Departamento de Ecología, Universidad de Granada, Facultad de Ciencias, Campus de Fuentenueva s/n, 18071, Granada, Spain. (2)Agencia de Medio Ambiente y Agua, Consejería de Medio Ambiente y Ordenación del Territorio (Junta de Andalucía), C/ Joaquina Egüaras 10, E-18013, Granada, Spain. (3)Laboratorio de Ecología (iEcolab), Instituto Interuniversitario de Investigación del Sistema Tierra en Andalucía (CEAMA), Universidad de Granada, Avenida del Mediterráneo s/n, 18006, Granada, Spain. Contrasting patterns of evolutionary diversification in the olfactory repertoires of reptile and bird genomes. Vandewege MW(1), Mangum SF(2), Gabaldón T(3), Castoe TA(4), Ray DA(2), Hoffmann FG(5). Author information: (1)Department of Biochemistry, Molecular Biology, Entomology and Plant Pathology, Mississippi State University, Mississippi State, Mississippi 39762, USA. (2)Department of Biological Sciences, Texas Tech University, Lubbock, Texas 79409, USA. (3)Bioinformatics and Genomics Programme, Centre for Genomic Regulation (CRG), Barcelona, Spain Universitat Pompeu Fabra (UPF), Barcelona, Spain Institució Catalana de Recerca I Estudis Avançats (ICREA), Barcelona, Spain. (4)Department of Biology, University of Texas at Arlington, Arlington, Texas 76010, USA. (5)Department of Biochemistry, Molecular Biology, Entomology and Plant Pathology, Mississippi State University, Mississippi State, Mississippi 39762, USA Institute for Genomics, Biocomputing and Biochemistry, Mississippi State University, Mississippi State, Mississippi 39762, USA Federico.g.hoffmann@gmail.com. Evaluating the efficacy of restoration plantings through DNA barcoding characterization of frugivorous bird diets. Galimberti A(1), Spinelli S(2), Bruno A(2), Mezzasalma V(2), De Mattia F(3), Cortis P(4), Labra M(2). Author information: (1)ZooPlantLab, Department of Biotechnology and Biosciences, University of Milano-Bicocca, P.za Della Scienza 2, 20126, Milan, Italy. andrea.galimberti@unimib.it. (2)ZooPlantLab, Department of Biotechnology and Biosciences, University of Milano-Bicocca, P.za Della Scienza 2, 20126, Milan, Italy. (3)FEM2-Ambiente s.r.l., P.za Della Scienza 2, 20126, Milan, Italy. (4)Department of Life and Environmental Sciences, Macrosection of Botany and Botanic Garden, University of Cagliari, Viale S. Ignazio 13, 09123, Cagliari, Italy. Hierarchical emergence of sequence sensitivity in the songbird auditory forebrain. Ono S(1,)(2,)(3), Okanoya K(1,)(2,)(3), Seki Y(4,)(5,)(6,)(7). Author information: (1)Department of Life Sciences, Graduate School of Arts and Sciences, The University of Tokyo, 3-8-1 Komaba, Meguro-ku, Tokyo, 153-8902, Japan. (2)ERATO, Okanoya Emotional Information Project, Japan Science and Technology Agency, 2-1 Hirosawa, Wako, Saitama, 351-0198, Japan. (3)Emotional Information Joint Research Laboratory, RIKEN BSI, 2-1 Hirosawa, Wako, Saitama, 351-0198, Japan. (4)Department of Life Sciences, Graduate School of Arts and Sciences, The University of Tokyo, 3-8-1 Komaba, Meguro-ku, Tokyo, 153-8902, Japan. yseki@vega.aichi-u.ac.jp. (5)ERATO, Okanoya Emotional Information Project, Japan Science and Technology Agency, 2-1 Hirosawa, Wako, Saitama, 351-0198, Japan. yseki@vega.aichi-u.ac.jp. (6)Emotional Information Joint Research Laboratory, RIKEN BSI, 2-1 Hirosawa, Wako, Saitama, 351-0198, Japan. yseki@vega.aichi-u.ac.jp. (7)Faculty of Letters, Aichi University, 1-1 Machihata, Machihata-cho, Toyohashi, Aichi, 441-8522, Japan. yseki@vega.aichi-u.ac.jp. 8. PLoS One. 2016 Feb 10;11(2):e0148570. doi: 10.1371/journal.pone.0148570. eCollection 2016. Linking Vital Rates of Landbirds on a Tropical Island to Rainfall and Vegetation Greenness. Saracco JF(1), Radley P(2), Pyle P(1), Rowan E(1), Taylor R(1), Helton L(1). Author information: (1)The Institute for Bird Populations, P.O. Box 1346, Point Reyes Station, CA, 94956-1346, United States of America. (2)Commonwealth of the Northern Mariana Islands, Division of Fish and Wildlife, Department of Lands and Natural Resources, P. O. Box 10007, Saipan, MP, 96950, United States of America. 9. PLoS One. 2016 Feb 10;11(2):e0147340. doi: 10.1371/journal.pone.0147340. eCollection 2016. Nolet BA(1), Gyimesi A(1), van Krimpen RR(1,)(2), de Boer WF(2), Stillman RA(3). Author information: (1)Department of Animal Ecology, Netherlands Institute of Ecology (NIOO-KNAW), AA Wageningen, The Netherlands. (2)Resource Ecology Group, Wageningen University, Wageningen, The Netherlands. (3)Department of Life and Environmental Sciences, Faculty of Science and Technology, Bournemouth University, Talbot Campus, Poole, Dorset, United Kingdom. 10. PLoS One. 2016 Feb 9;11(2):e0148928. doi: 10.1371/journal.pone.0148928. eCollection 2016. Population Viability and Vital Rate Sensitivity of an Endangered Avian Cooperative Breeder, the White-Breasted Thrasher (Ramphocinclus brachyurus). Mortensen JL(1), Reed JM(1). Author information: (1)Department of Biology, Tufts University, Medford, Massachusetts, United States of America. 11. Curr Biol. 2016 Feb 8;26(3):R105-7. doi: 10.1016/j.cub.2015.12.005. Supergenes: The Genomic Architecture of a Bird with Four Sexes. Campagna L(1). Author information: (1)Fuller Evolutionary Biology Program, Cornell Lab of Ornithology, Cornell University, 159 Sapsucker Woods Road, Ithaca, NY 14950, USA. Electronic address: lc736@cornell.edu. Authoritative Images. The Kiwi and the Transactions of the Zoological Society of London. 13. PeerJ. 2016 Feb 1;4:e1652. doi: 10.7717/peerj.1652. eCollection 2016. Patterns of bird-window collisions inform mitigation on a university campus. Ocampo-Peñuela N(1), Winton RS(1), Wu CJ(2), Zambello E(3), Wittig TW(1), Cagle NL(1). Author information: (1)Nicholas School of the Environment, Duke University , Durham, NC , United States. (2)Nicholas School of the Environment, Duke University, Durham, NC, United States; Ecology & Environment Inc., Arlington, VA, United States. (3)Nicholas School of the Environment, Duke University, Durham, NC, United States; Tourism Development Department, Okaloosa County, Fort Walton Beach, FL, United States. 14. PeerJ. 2016 Feb 1;4:e1598. doi: 10.7717/peerj.1598. eCollection 2016. Phylogenetic and morphologic evidence confirm the presence of a new montane cloud forest associated bird species in Mexico, the Mountain Elaenia (Elaenia frantzii; Aves: Passeriformes: Tyrannidae). Hanna ZR(1), Ortiz-Ramírez MF(2), Ríos-Muñoz CA(3), Cayetano-Rosas H(2), Bowie RC(4), Navarro-Sigüenza AG(5). Author information: (1)Museum of Vertebrate Zoology, University of California, Berkeley, Berkeley, California, United States of America; Department of Integrative Biology, University of California, Berkeley, Berkeley, California, United States of America; Ornithology & Mammalogy, California Academy of Sciences, San Francisco, California, United States of America. (2)Museo de Zoología, Facultad de Ciencias, Universidad Nacional Autónoma de México, México, Distrito Federal, México; Posgrado en Ciencias Biológicas, Universidad Nacional Autónoma de México, México, Distrito Federal, México. (3)Museo de Zoología, Facultad de Ciencias, Universidad Nacional Autónoma de México, México, Distrito Federal, México; Unidad de Investigación en Medicina Experimental, Facultad de Medicina, Universidad Nacional Autónoma de México, México, Distrito Federal, México. (4)Museum of Vertebrate Zoology, University of California, Berkeley, Berkeley, California, United States of America; Department of Integrative Biology, University of California, Berkeley, Berkeley, California, United States of America. (5)Museo de Zoología, Facultad de Ciencias, Universidad Nacional Autónoma de México , México, Distrito Federal , México. 15. Res Vet Sci. 2016 Feb;104:123-5. doi: 10.1016/j.rvsc.2015.12.010. Epub 2015 Dec 23. Plasmodium spp. In a captive raptor collection of a safaripark in northwest Italy. Scaglione FE(1), Cannizzo FT(2), Chiappino L(2), Sereno A(2), Ripepi M(3), Salamida S(4), Manuali E(4), Bollo E(2). Author information: (1)Dipartimento di Scienze Veterinarie, Università degli Studi di Torino, Largo P. Braccini 2, 10095 Grugliasco, Italia. Electronic address: frineeleonora.scaglione@unito.it. (2)Dipartimento di Scienze Veterinarie, Università degli Studi di Torino, Largo P. Braccini 2, 10095 Grugliasco, Italia. (3)Practicing Veterinarian, Safaripark Pombia, SS 32 Km 23,4, 28050 Pombia (NO), Italia. (4)Istituto Zooprofilattico Sperimentale dell'Umbria e delle Marche, Via Gaetano Salvemini, 1, 06126 Perugia, Italia. PMID: 26850550 [PubMed - in process] 20. Parazitologiia. 2015 Jul-Aug;49(4):304-8. NEW DATA ON BIRD HELMINTHS IN MONGOLIA. Lebedeva DI, Chantuu K.